OUR BASIC SITUATION as human beings is very rich and full of resources. We have the ability to blossom into a far richer and saner state of mind than we usually experience. This potential is like having access to a very healing and effective medicine. If we apply it and make use of it, it will bring health and well-being. The question is how to do this. How do we use our resources? First, we need to have the proper understanding of how to work with our resources in order to experience their meaning. For example, if we want to write something down so it will make sense and be purposeful, we need to have paper and a functioning pen. We also need the efforts of our hand and our eyes and, most importantly, the cooperation of our mind. If any of these factors is missing, the writing is bound to be incomplete. If there is no ink, we cannot get anything written down. If our eyes do not look at what we are writing, we will make a lot of mistakes. Whether or not we would even be writing on the paper would be uncertain. If the mind is distracted with ideas other than those we were going to put on the paper, we will also make a lot of mistakes. In this situation, which is very familiar to us, we realize the cooperation of all these different components is necessary. Similarly, in working with the mind and applying the appropriate techniques to develop an awakened state of mind, we must have the cooperation of certain elements and the sincere application of these elements. In the sutras, the Buddha explained that in taming the mind we must bring ourselves to a place of solitude, or to a situation of solitude. This does not necessarily mean going to some deserted place in the wilderness. Solitude, in this sense, is more like security. It is not a place of solitude if we have to worry because the place we are using belongs to somebody else and we might be told to leave, or because there might be some wild animals there, or because it is a place that is not physically stable so there is a chance that something could fall down. When we are subject to these kinds of apprehensions from an environmental or physical point of view, it is not a suitable place for meditation. Also, we could be in a quiet place, a safe place, and yet internally our minds could be preoccupied by all kinds of thoughts. We could be thinking about things we need to do, certain mistakes we have made, or regrets or frustrations we have about our mistakes. We could worry that the phone might ring, that we have missed an important appointment, and so forth. We could entertain our minds with all kinds of thoughts and distractions. In this case also, we are not really in a place of solitude or quietude, except in a superficial sense. Such indulgence does not produce the experience of taming the mind or directing the mind toward a saner approach. The antidote to this indulgence lies in our commitment. When we commit ourselves to finding quietude, we must commit ourselves fully and sincerely. We must make a sincere commitment to ourselves that when we are involved with meditation, we will be totally involved, rather than continuing with our usual pattern of constantly recollecting the past, anticipating the future, or being entertained with all kinds of other thoughts, which are actually deceptive. We need to make a commitment that we are going to stay strictly with what we are doing. The sutras go on to say we should settle ourselves on a comfortable seat where we do not have to lean to the left or right or too far forward or backward. That kind of leaning could result in imbalances in the workings of the physical systems--in the constitution of the body. Then with this comfortable, level seat, we need what is traditionally called TING NGE DZIN BUR CHON. 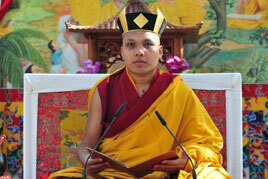 TING NGE DZIN means samadhi or meditation, and BUR CHON means cushion-meditation cushion. Traditionally, in Tibet, meditators would use a square meditation cushion four to five fingers high. Some people need it to be a little lower or higher, depending on their physical proportions. Sit on the cushion with it more to your rear than to your front and bring the body to the best possible position, sitting up quite straight. After having taken your place on the cushion, place your legs, if possible, in the vajra position. [Editor's note: This has also been called full-lotus position, but that term is not used by Tibetans.] This is not an easy position, and if you are not used to it, the ordinary cross-legged position (the sattva position) is suitable. The vajra and cross-legged positions are referred to as the "positions of indestructibility" in the sense of being stabilized or grounded. This is the first position of the body. The second position of the body is called "drawing up." After sitting in the cross-legged position, adjust the position of the body to bring in, or fold in, the buttocks. Then close and tighten the sphincter muscles and, with a certain amount of effort and without breathing, pull the abdomen and the inside organs upward. Then very gently and slowly relax everything back into a normal position. What we are talking about here is how to facilitate an effective taming of the mind from the external point of view. This particular position, for instance, contributes to our health and to maintaining the vitality and warmth of the body. This definitely contributes to strengthening and taming the mind. The third position is to touch the tip of the thumb on each hand to the first or second joint of the ring finger--the first joint being the one connecting the finger to the hand. The thumb can be on either joint, depending on which feels more natural for your hand, but not between the joints. Then close the fingers into a relaxed and gentle fist, and bring those fists palm-downward onto the knees. Whichever position you are able to maintain naturally, the important point is that your back is erect and your knees are down on the ground as much as possible. If this is already pretty well established and you have these positions correct, you should not have to exert any effort, but just keep your elbows and arms straight. This has more to do with keeping the structure of the bones erect, rather than having any tension in your flesh, skin, or muscles, which should remain relaxed. Only the bone structure is kept erect. If your back is not very straight and you have difficulty bringing your knees down, exerting a little effort and straightening your arms will eventually help bring the knees down a little closer to the ground, which will keep your back more erect. For the fourth position, you may notice that even when your arms are straight, your back may still be curved or you may be slouching, perhaps because your hands have moved a little bit over your knees. If this is the case, as you continue sitting, you will get more and more out of position and slouch more and more, even though your arms are still straight. If this happens, you should straighten your spine. Maintaining a straight and erect position in this way is very important. Straighten the lower part of your back, which involves a slight tilt of the pelvis, moving the stomach area back to remove any arch in your lower back. The fifth position concerns the gaze of the eyes. Without making a particular effort to look cross-eyed, bring the focus of both your eyes onto the nose, and from there bring the focus of the eyes down a straight line to a point an elbow's length in front of your body. Even if your back up to the point of the neck is erect, your neck may be tilted left or right or backward or forward. Placing the gaze in this way helps to keep your neck from tilting too much backward, forward, or sideways. The sixth position is to let your tongue rest flatly and somewhat tightly against your upper palate. The tongue is slightly curved forward and rests in the mid part of the front of the roof of your mouth (neither at the very top of the roof of the mouth nor right behind the front teeth). Like all the other positions, this one has an immediate or temporary benefit, as well as a long-term benefit. In this particular case, the immediate benefit is that when you properly rest the tongue in this way, you do not have to go through the effort and the disturbance of swallowing again and again, and it also helps to keep you from coughing. The seventh position of the body concerns the fact that your neck may not be properly erect. Even though it is basically straight from placing the gaze of the eyes downward, it may still be craned a little bit backward or forward. To avoid that, pull your chin in slightly so there is a light pressure on the voice box. In this way, the neck vertebrae are in alignment with the spinal vertebrae, creating a very correct and erect position. These are the seven positions of the body, which are very highly recommended in the different levels of the teachings. Because some of us are not accustomed to these different positions, or because of the difference in flexibility of our bodies and so forth, some people may be able to do the positions better and more immediately than others. Whatever may be the differences, it is important to understand these positions and to commit ourselves to getting into these positions as closely as possible in our meditation practice. What are the defects of not being in the proper positions? For instance, if we meditate staring upward all the time, we might at first feel very light and comfortable and think this feels right in the sense of being clear. But after a while we may feel a sense of speeding up or floating and are more susceptible to anger or frustration. Because of the relationship of the body and the mind, poor posture can bring out these sorts of emotional patterns. If we practice while slouching down, there may be a temporary feeling of comfort and relaxation, but actually we are not taming the mind in a disciplined way. It is said that continuing in this way is a greater cause for ignorance. We become more and more slothful and fall asleep. According to the way the constitution or chemistry of the body operates, we are stimulating various patterns. If we tilt to the right side while meditating, we are more susceptible to being entertained by the more pleasurable kinds of distractions. If we tilt to the left side, we are more susceptible to unpleasant desires and that type of distraction. When we lean left or right, the different aspects of distractions will increase and we will be more susceptible to the different types of desire. With this understanding, we can see the importance of the positions of the body. Keeping these seven positions in mind and training properly in applying them is very important. Failing to apply even one of these positions causes many defects in the taming of our minds. Initially it may not be very easy and comfortable to get into these positions. It may mean suffering a little discomfort or going through a little effort, but in the long run it will definitely be more than worthwhile. For instance, as explained earlier, getting the pen and the paper and the mind and the hand and the eyes together might be considered an effort or inconvenience, but sometimes thinking of something as being inconvenient is not a true picture of the situation. If we have the cooperation of all these faculties, we can get a very important message conveyed properly, and the so-called inconveniences were worthwhile. On the other hand, if we did not work through these inconveniences, the lack of one of these factors means the important message does not get through. In the same way, maintaining all these positions of the body contributes toward the effective taming of the mind and toward greater and greater calmness and sanity. 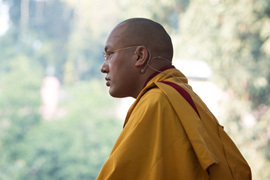 There are many different techniques for working with the mind in meditation. If other people are not using exactly the same techniques as you, that does not mean theirs is totally different or wrong as far as basic meditation is concerned. For example, as a method for developing mindfulness and one-pointedness of the mind, certain objects can be used, such as a dot, a ray of light, a syllable or letter, or something else. These are not the most effective or convenient techniques, however. Initially, we may be able to relate to such an object easily. As a new situation, it may for a while be a source of entertainment, and we may feel more comfortable concentrating on it. Yet, for two reasons this may not be the most effective technique. The first reason concerns the gradual progression of our minds from a state of thought to a state of non-thought, a nonconceptual state. It is not easy to let go of clinging to separate, substantial, solid entities and move to understanding nonsubstantiality, or the state of no reference point. If we have developed so much familiarity with a certain image that we cannot see how to stop viewing that image as real or solid, this can present an obstacle, although it does not necessarily have to. The second reason such an object of meditation is not the best is that it is not particularly natural. It is something outside ourselves and, in some sense, superficial. After the initial fascination subsides, we feel very much apart from it. The most effective and natural meditation technique is to work with the breath. From the moment we are born until we take our last breath and die, it is like our life force. We have a very intimate relationship with it. We breathe constantly. Considering the possible shortcomings of other methods, relating to the breath is a most effective technique. After having first understood the importance of both inner or mental solitude as well as solitude in your immediate environment, you apply the seven positions of the body. There is not a specific order in which to apply the positions, but initially you should be certain the positions are correct. You should not anticipate anything once you are able to comfortably get into these positions and maintain them. What happens when you apply the positions is that you sense you are in a state called "harmonious surprise." There are no distractions, and you are surprised because you are not bothered by all kinds of thoughts. Not all surprises are pleasant or harmonious, of course, but this one has a harmonious air. Those who are not used to the positions and experience certain discomforts will not easily find themselves in this sort of environment of openness. Because of our long history of habitual and emotional patterns and upheavals, we may not remain in the state of harmonious surprise for long--maybe just for a moment. This depends on how long we have been practicing, among other things. After this initial period of time, distractions or thoughts arise. When these thoughts arise, take a slow, gentle, deep breath into your nostrils and bring the sensation of the breath down below the navel. Then without holding the breath, simply breathe out. This breath automatically breaks the chain of thoughts or distractions and centers you. It also brings in purer air and lets the stale air out. Having centered in this way, simply follow your breath. When the breath is going out, your mind follows the outgoing breath; when your breath is coming in, your mind follows the incoming breath. There is nothing artificial about it at all after the first deep and slow inhalation. From then onward, follow the normal pace of the breath, whatever it is, not trying to make any point, not making any effort to slow down or speed up. Simply follow the normal course of the breath without any ideas about how far it is going out or what the location is of this and that. Just let the mind watch the breath, or follow the breath, or be one with the breath. This is how to relate to the breath as a vehicle of concentration. We only relate to the breath and have no relationship to anything else. More experienced practitioners, who are able to maintain the concentration of the mind in this way quite easily without distractions, can work toward some degree of improvement where they just follow or are aware of the sensation of the breath going out of the nostrils--following only the outgoing breath. In this way, they shift from two references--the outgoing and incoming breaths--to just one vehicle of concentration. There are two main obstacles that interfere with the effectiveness and steadiness of meditation practice. The first one, as is said in the sutras, is restlessness or "wildness." This happens because we are very strongly or very acutely involved with a particular emotion (such as anger, aggression, or attachment) or with an exciting argument or physical activity. When this is the case, you may place yourself in the meditation positions, but you do not seem to get settled; in fact, trying to correct your positions makes things even worse. If you keep meditating like this, you may gradually become more angry or frustrated. You try to tighten things up, but that does not work, and you have more thoughts and get more hyper and restless and become very frustrated. To work with this, the sutra recommends lowering your focus and relaxing your positions. Just relax, letting the head bend downward to your chest and closing the eyes very gently. Your breathing also should be very gentle. Visualize that your breath becomes very dark and very subtle and goes down into the earth, deep into invisible depths. Then slowly inhale. As you inhale this dark and almost invisible breath, it is as if your whole being is becoming darkness. Remain in this state of darkness, repeating this several times if needed. By doing this, you will feel more stabilized and normal and not as involved with those wild mental patterns. Then resume the standard positions. If you apply this antidote for too long, you might fall asleep, so as soon as you feel relaxed, or normalized, get back into the positions and relate to the breath as before. Another obstacle is sluggishness. Sometimes the place where you are meditating is warm and humid, or you are very full with a heavy meal, or it is dark, and so forth. Maybe you have done a lot of work and are somewhat tired. Then when you try to meditate in the normal position, you feel you are being pulled down somehow. You have a sense of being physically pulled down out of your positions. Mentally, following the breath becomes more disconnected or vague. It is even difficult to tell if you are being distracted or not. It is almost like going into a state of oblivion. When such a situation arises, it is not very effective and skillful to keep trying. Instead, shift your position and straighten up your overall posture--your whole body, not just the bone structure. Exert some effort, tightening up your position more than ever. Look straight upward with your eyes, turning your head upward as well. Visualize a very bright light above you and imagine that your breath is going out to the light and coming in from the light as you exhale and inhale. In this way you will feel more awake and more normal, physically and mentally. From there, go back to the regular positions and relate to the breath as before. Do not stay with the antidotes after you feel more normalized. Once you feel more balanced, go back to following the breath, either both outgoing and incoming or only the outgoing, whichever is best for you. These are useful antidotes for the two basic obstacles. There are also more details and variations of these methods that you can get from a meditation instructor. Various people experience meditation differently. For some people, meditation is initially very comfortable and pleasant, with hardly any distractions and thoughts; then as they continue sitting, they begin to have more thoughts and to feel more disorganized. This may continue to the point that, at the end of the session, they are almost frustrated with all the distractions. There are many possible reasons for this, but one of the main ones is overexertion: working so hard on the positions and using so much effort that they become uptight. In one sense, they are not paying any attention, but in another sense, in the name of concentration, they are making themselves more tense and uptight. This is not very effective or appropriate; therefore, things do not go very well. When this happens to you, loosen or relax your positions a bit. What we are looking for is a sense of being well composed and together, both physically and with mental concentration, but also a sense of openness and of being at ease. That is important. Other people have a different experience of meditation. For them, meditation is initially quite uncomfortable. They feel something is out of balance with the positions, and they have quite a lot of thoughts. Then gradually, as they get toward the end of the session, they have fewer and fewer thoughts and less of a sense of discomfort and inconvenience. At the end, they feel there is good cooperation between mind and breath. Were they to continue meditating, to expand the session, it would be more than appropriate--it would be welcomed. If the meditation is taking this course, with a sense of openness and with fewer distractions, this is generally a sign that things are happening in the proper way. At that point, it is a matter of continuing to work in the same direction. One very important point is not to leave your meditation practice only to the formal meditation session. When you have completed your session of practice, do not throw it away and go back into your old patterns. If you do that, your experience of the benefits of meditation will happen very slowly and very rarely. When you have finished your formal practice, you must try to go into the world with the meditation--maybe not fully, but definitely with some element of it, some kind of momentum, some quality of it. For instance, you might go out with some mindfulness of gentleness or softness. Of course, even gentleness can be very aggressive if there is a great deal of stubbornness present. To be strong, to be precise, you do not have to be aggressive. You should go out into the world after meditation with a sense of genuine gentleness and softness. Once in a while, whenever you can remember, you should alert yourself to the quality of meditation or to some aspect of meditation. You do not have to go through all the positions and follow the breath, but just be with yourself, just rest in some sense of awareness. This is very important to do as frequently as possible. You do not have to spend a long time at it or take on some sort of dazed look, but just for a moment be aware. It could even be at such times as when a cup of tea is coming to your lips. It takes some time until the cup arrives; maybe you could be aware just that time. You could also be aware when you put the cup down, or during any other sort of break. Some sort of possibility of a shift of awareness is always present, even if you are in the midst of chaos, such as in a crowd, with all kinds of things to figure out, or if you are suddenly subjected to fear or apprehension. In such situations if you could pause just for a moment, it would be like opening a whole new perspective. If there is chaos and confusion, you begin to have a sense of order, or at least some sense of what to do and where to begin. Being caught up in apprehension and fear is actually the opposite of openness. If you are involved in some argument or exchange, being able to come up with a better way of seeing is very very helpful. Alert yourself to the mindfulness of doing this. If you do it time and time again, you can definitely be assured of having a much clearer picture of things. In this way, meditation practice can help you develop more of a sense of efficiency and precision in your daily activities, your job, career, and everything you do. When some of your chaos and conflict has been cleared away, it is much easier to work with the problems that continue to come up. Even if there is not much profound benefit initially, at least you will have the benefit of getting a sense that if you meditate more, there will definitely be a greater chance of this basic openness developing. Therefore, there is real benefit in terms of clarity of mind and openness. There is more room to work, so to speak, which is very important. Through disciplining yourself in the formal meditation practice as well as the informal practice of mindfulness, after a while you will experience some benefit. Then you will respond to meditation more easily, so it comes with less effort. In short, in any sort of situation, whether you are writing something or reading a book--even while you are turning the pages--you can come back to yourself and practice this kind of direct mindfulness. Here is an example of how this recollection of mindfulness can work. In traditional monastic education, memorization (particularly of the different root texts) is very important, so that when the students receive instructions on the various commentaries and meanings, they can quote from many different texts right there on the spot. They have many references for strengthening and clarifying a particular point. 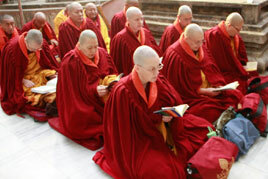 Some younger monks would work very hard during a session of memorizing, but then go off and get involved in playing. Finally, they would realize it was time to get back to work but would have some difficulty getting back to what they had memorized. 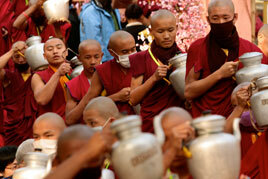 However, there were other monks who were more responsible and more sensible than the young monks. While they were playing, they would also try to spend a little time recalling the next line, or the next few lines, of what they were memorizing. Afterward, when another session began, they would remember whatever they had memorized in some order, and they continued to remember it. Briefly reviewing, one of the essential points to remember is the importance of the positions of the body. For any activity to be effective or reach fulfillment, whatever contributes toward its fulfillment and effectiveness should be incorporated into the activity. From this point of view, the different positions of the body contribute to the calming and taming of the mind. Following the breath is used as a technique for further developing the tranquility of the mind. Also, in addition to practicing this informal meditation sessions, remember to incorporate it into your day-to-day activities. By alerting yourself to situations of mindfulness, you should take a moment to be present with yourself and, in this way, relate to the qualities of meditation. Next I will briefly explain the benefits of meditation practice. First of all, I must say I cannot explain all the benefits that come from meditation practice at this point, and even if I did explain, it probably would not make much sense. We can discuss it though, in terms of immediate benefit, gradual benefit, and long-term benefit. As you practice the stages of meditation, you will experience these various benefits, and they will be explained. The initial point is that the benefit of meditation practice is not simply limited to experiencing a more relaxed or calm state of mind. There is more than that. It is something for us to commit ourselves to and apply in our lives. One subject to understand is the effect of meditation on our physical bodies. Our bodies are made up of what are called the five elements. The solid, or heavy, aspect of the body is the earth element. The heat and warmth of the body is the fire element. All the different kinds of fluids make up the water element. The lightness, or movement, of the body is the wind or air element. Finally, the various openings and hollow spaces in the body make up the space element. In the midst of this system is the mind. From the confused point of view, the mind is a constant pattern or chain of thoughts. Because of these continual thoughts, we find ourselves engrossed in all kinds of emotional patterns and habitual tendencies that bring about indulgences and entertainment. This stimulates further discursive thoughts and makes them more real, resulting in more confusion. This is what is called samsaric mind--mind operating according to samsaric patterns. 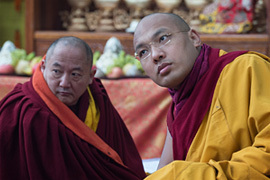 When the mind is not involved in such discursive thoughts and is beyond being subject to habitual and emotional patterns, we refer to it as the enlightened mind or, from the point of view of the Vajrayana teachings, as the "Buddhanature," whose nature is totally pure. The elements that make up our bodies are not just elements as we usually think of them. These elements also have the quality of wisdom as their essence. You may have heard of incidents involving the bodies of great masters. For instance, after some masters pass away, their bodies dissolve and disappear into a rainbow body with nothing substantial being left behind. When certain other masters pass away, their physical bodies diminish to a very small size. When the bodies of some meditation masters are cremated, relics or rainbows or showers of flowers appear. These are incidents observed by ordinary people, those who have confused perceptions. 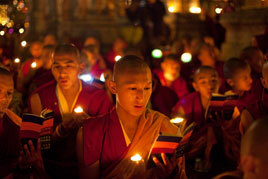 Beings who are more highly realized witness different, more profound events. What happens in these events is an expression of what makes up our bodies. The elements in some sense are not just elements. In the case of these great masters, the occurrences described are an expression of their realization of the insubstantial and uncompounded nature of all things. Because they have transcended the clinging to the illusion of reality, their realization is outwardly expressed in these ways. As a person advances in practice, in addition to the realization of meditation, many exceptional or profound experiences or attributes of realization occur. There have been many such incidents, and it is entirely possible for them to happen to anyone who meditates continuously and diligently. For instance, a person who is getting older may begin to put on a more youthful appearance. There have been incidents where hair that had become gray began to turn back to its original or natural color, and the person began to have clearer vision. The physical or outward expressions of our bodies are made of different elements but are not simply limited to the functions of the elements. Instead of becoming senile with age, losing memory and clarity of mind, a meditator may develop a clearer and more stable state of mind. Sometimes people begin to easily understand and have insight into texts and fields of study they were not familiar with previously. 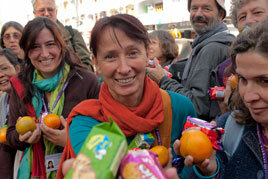 There is also an expression that a practitioner can "live on the food of meditation." This means the person is nourished only through the power of meditation, not by eating some sort of nutritious food. These situations actually happen. If people are constantly involved in anger or tremendous aggression or tremendous attachment, they are overwhelmed by it. So much is dictated by their aggression and attachment that their energy is completely drained, leaving them feeling wiped out. They have the feeling of being older than they really are, and their minds are more scattered and spaced out than they should be. In relating to the activities in life, whether spiritual or mundane, their sense of workability disappears, and they face a state of bleakness. Because their potential for true wisdom has been mishandled or misused, they bring a kind of destruction upon themselves. In the past, in both Buddhist and non-Buddhist traditions, it was quite popular to wander into the wilderness as an ascetic. The methods for meditation were limited to techniques similar to shamatha. The ascetics would go out and, with great exertion, meditate for months and years under a tree or leaning against a boulder. For one, two, or even several years they could be seen meditating, their bodies looking very weak and almost taking on the color of the tree or the rock. Unless you got a closer look, you might not be able to make them out. They were practically fading into their environment, but still they were surviving. Because they were not distracted, they developed a certain tranquility of mind. When a meditator has developed this tranquility of mind but has not been introduced to further development of the meditative state, there is a continuous clinging to this tranquility or blissfulness. All this time, they are nurtured or sustained by the wisdom of the tranquil mind, yet because they cling to this tranquility, the wisdom is not recognized. Something is working even though it is not recognized, so even when there is a limited understanding of meditation, some benefit still takes place. There have been many such incidents in the lives of hinayana practitioners. The view or understanding of those on the hinayana path is that there should be an absolute renunciation and an absolute revulsion toward the pain and suffering of cyclic existence, as well as a tremendous longing for the bliss and tranquility of meditation and for what might be beyond cyclic existence. These practitioners also go into places of isolation and solitude, meditating there for so many years that physically, or outwardly, it is difficult to determine whether they are animate or inanimate, yet a sort of awareness and consciousness continues. In the mainstream of Buddhist practice, there also have been people who had the good fortune of encountering an outward situation in which the benefits of meditation were manifested. In one particular incident, one meditator's only source of food for three years was the liver of a sheep: Certainly he lost some weight, but other than that, his mind was clear and continuing. Then, of course, we may be more familiar with the great meditator and yogi Milarepa. For many years, Milarepa meditated continuously in the mountains. There is a story about how he lived on nettles, but even that is uncertain because it would have been quite difficult to get nettles in the summer, let alone in the winter. Yet, after many years he was continuing, and with great realization! If you think practicing meditation brings something profound into your life from outside yourself, you are totally off the track. That is not the correct view, understanding, or reality. The point is to work on the abilities or potential you have within. You yourself have everything needed to develop the very basic and preliminary benefit, as well as the most inconceivably advanced benefit. It is just a matter of recognizing it and being able to tap into it. 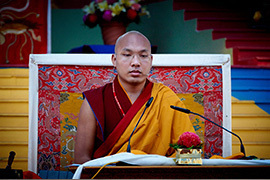 I have introduced you to the positions of the body, such as sitting in the vajra position (or if that is not possible, in the cross-legged position), then placing the tips of the thumbs on the first or second joints of the ring fingers and bringing the focus of the eyes down about an elbow's length in front of you. The reason for this is that actually there are five winds that operate within our being. Each of these winds has wisdom as its essence. When these winds, or wind-energies, go out of our bodies, we begin having all kinds of distractions, all kinds of thoughts in the areas of ignorance or aggression or attachment. This brings us a lot of confusion, because the wisdom quality of these winds is diminished or weakened. The three positions just mentioned keep the" All-Pervasive Wind," (one of the five) in proper control. When the All-Pervasive Wind is kept in good control, the wisdom is also kept in, nurturing our development. These three positions of the body are outward positions, but inwardly they help retain the All-Pervasive Wind. Another of the seven positions is known as "drawing in." After you have settled into the first three positions, you reestablish the sitting position, bringing in the flesh of your bottom by closing and tightening the sphincter muscles somewhat, as well as pulling in the whole of your abdomen and organs with a certain amount of effort, and then very gently relaxing everything. This is the outward position of the body, but inwardly it contributes to keeping intact what is called the Lower, or Abdominal, Wind and helps retain the wisdom related to this wind. Our body has certain potentials. For instance, it has the potential to experience the state of well-being and also the potential to keep itself warm. How much of this heat and well-being we experience depends on how well we have tapped into these potentials. By retaining the Lower Wind with this particular position, we are retaining the potential of well-being and the potential of heat. This nurtures the body physically and in turn nurtures the mind toward the development of greater wisdom and sanity. In the higher tantric traditions, there is a vehicle of meditation known as the Heat Yoga. Doing this practice properly, a person could be in the middle of a cold and snowy place--even naked in the snow--yet feel very warm. 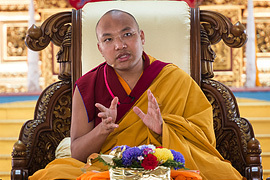 At some later time, we may receive the core instructions for doing this practice according to the Vajrayana methods; now I am just presenting some background so you can acquaint yourselves with this possibility. Another of the positions is keeping the back straight and erect, with the vertebrae of the spinal column in a straight line. By using this position, you provide adequate room for the wind that operates around the navel area, known as the Wind of Metabolism. Indigestion and similar physical ailments are due to a lack of or a weakness in this particular wind-energy. Giving the Wind of Metabolism room to operate helps keep it intact and inwardly, or internally, contributes toward the nurturing or development of the mind. The next position of the body is to let the tongue rest flat against the palate. The explanation given for this on a physical level is that it helps prevent the need to swallow saliva again and again, which is desirable because the effort and sound involved in this could be a distraction. In addition, if you are coughing, resting the tongue like this could prevent or lessen the coughing. Once you are sitting with all these other positions intact, you still might be craning your neck a little bit too much either backward or forward, so the last position is to bring your chin a bit back and in until you feel a slight pressure on the voice box, then easing up a bit so there is no tension or pressure, and remain in that position. The outward purpose of this is to bring the neck vertebrae into alignment with those of the back. Inwardly, the wind related to these positions is called the" Up-Going" or "Up-Running" Wind. Letting this wind-energy wander causes many kinds of distractions and therefore stimulates habitual and emotional patterns that give rise to numerous indulgences. Keeping the Up-Running Wind intact is important because this wind-energy contributes toward the realization of the truth of the mind. By using the physical positions of the body, these four winds are kept in proper control. The Lower (Down-Moving) Wind, the Up-Going Wind, and those in between are kept in their natural or proper places. The fifth wind is referred to as the "Life Wind" and could be called the Home of Wisdom. It is where the essence of wisdom is found. When the other winds are kept intact, they feed this central or Life Wind and thus expand wisdom. Right now we are simply acquainting ourselves with the positions and gaining a small understanding of the possibilities of experiencing all the other winds going into the Life Wind, making the home of wisdom their home. For us this is not actually happening, and it is not very easy to make it happen, but when it does happen to someone, we say that person is in a great state of samadhi. Many scientists have wanted to find out what happens when a person meditates in a state of samadhi in which the other winds have joined the Life Wind. Up to this point, it has not been seen as appropriate to experiment on this. However, when all the other winds have entered into the Life Wind, if you feel near the person's nostrils, you find no breath coming out. The person is not breathing. Or if you feel the pulse of this person, it is not pulsating. Yet, even though the person is motionless, they look as if they are glowing more than usual. This happens when all the winds have cooperated with each other and the different aspects of wisdom have become integrated. We are talking about issues that presently seem quite inconceivable and unrealistic. Perhaps it seems anything we can see and touch and feel is realistic, but whatever goes beyond this is unrealistic. Yet the truth is that when a person experiences such wisdom, or such a state of samadhi, they have insight into the past or the future. They gain a great deal of wisdom and have realizations of many kinds. This is genuine--an experiential situation--so meditation practice should not be treated lightly as if it were some kind of ordinary show. You should not think that someday you will attend to it but it is not so important now, or that if you do it once in a while, it will develop properly (as some small activities do), or that after you have meditated several times, you know all about it. It must not be treated lightly in that way. This is another important point: You may meditate for a while and find that nothing exciting or drastic or different is happening. You begin to wonder: "What could actually happen?" So you give up. First you begin to give up the positions, thinking "What is the point of sitting in these different positions? They are more uncomfortable and more disturbing than things normally are for me." Eventually you quit meditating completely. This possibility definitely exists. I have personally been giving these instructions to everyone, so you have been informed of the facts and of the importance of these positions. 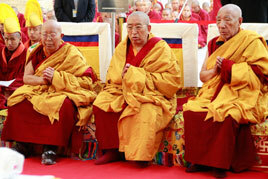 Other lamas such as the Venerable Chogyam Trungpa have also emphasized shamatha practice and given these instructions. The point has been made. For various reasons, sometimes it is not necessary or skillful to make everything clear. My sincere hope is that you will learn these things I have explained to you. I trust in your sincerity, your sense of commitment to the practice, and your willingness to make genuine use of what has been made available to you. When you were given the meditation instructions, a jewel was given to you, a very special jewel that you will find nowhere else. You should use it wisely. Sometimes there is concern as to whether people really know they have been given a jewel, or whether they will use it properly. The point here is, yes, it is a real jewel both inside and outside. It is not a fake. Do not let it get stolen or leave it somewhere or lose it. Keep it with you all the time. Make it yours, because it is really precious. You might not get this kind of jewel again. The jewel has been given to you along with some important guidelines concerning its true value or benefits, benefits that cannot be compensated for by any other so called jewels. Keep this point in mind and use it as a stepping-stone to keep going. These positions and practices are not just showpieces. They are not peculiar customs or cultural exhibitions. If they were only that, it could become very frustrating. If all you were doing was sitting in these positions and trying to block distractions, you could definitely go crazy. How long could you just keep blocking your thoughts with nothing happening? How long could you sit like that? Do try these positions. Make use of this resource and of the being that you are. Begin knowing and touching the proper points, and there can be great growth. If you do not understand these points or relate to them, naturally there will be no benefit. You would be like a prisoner who was told to go into a particular cell and sit in a particular way and then was kept in isolation for some period of time. Instead of calming down and getting better, the prisoner would probably get worked up to the point of going crazy. Simply being alone in a particular place and sitting in some kind of position is not enough. Earlier I mentioned that in your spiritual life, as well as in your material or mundane life, meditation practice can bring about different levels of benefit and wisdom and can affect the clarity and tranquility of your mind. It can help you become a good communicator and can help you relate to your practice with deeper appreciation, insight, and understanding. You can also relate to your work with an increased sense of accommodation, openness, and efficiency. If you can understand how you truly function, and if you can tap into the resourcefulness of your body and mind, these things can definitely happen in your life. As you may know, the sutras mention both sitting and walking meditation. 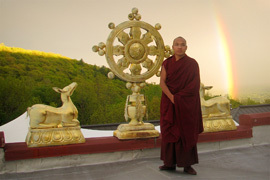 The idea of strong mindfulness and awareness runs throughout these teachings. The traditional instructions are given that "when you are sitting, know you are sitting, and when you are walking, know you are walking." This refers to the strong practice of moment-to-moment presence of mind. 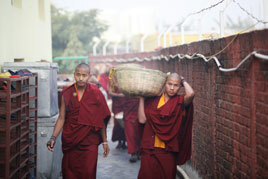 In the past in Tibet, though, walking meditation was not popular; in fact, it was not done. It was the custom then to sit cross-legged on the ground or floor. Maybe this is one of the benefits of underdevelopment--people were not accustomed to sitting in comfortable chairs. When they were studying and receiving teachings, they simply sat cross-legged. When people were meditating and resting the mind with all the specific positions we discussed, the feet and knees and so forth did not get tired or present any problems, so walking meditation was not introduced or encouraged. Now we seem to be in a time in history when the wisdom of the Buddha can be applied in many different ways. Different things are important and applicable. Now people are not as used to sitting cross-legged, and when they sit for a long time, they get mentally dull and are bothered by pain. Instead of stopping and not doing meditation at all, it is better to do a combination of sitting and walking practice. This gives some exercise as well as some possible room for clarity of mind. The body also gets rested, and between these, whether you are sitting or walking, the mind becomes clearer. Another important reason walking meditation can be beneficial is that it is a closer step toward post-meditation, but without having left the meditation at all. This takes you closer to bringing meditation, or some sense of meditative momentum, into your ordinary day-to-day life. This bridging between formal and informal practice seems to be an important step. In doing walking meditation practice, the sutras do not specifically describe where your hands should be and how you should walk. However, from a physical point of view, to have your hands swinging at your side could be a hindrance instead of a contribution toward the tranquility of the mind. Therefore we hold our hands together in front, at the level of the heart, with the palms up and the right hand on top of the left. 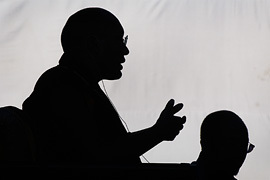 This is also a gesture of mindfulness, in the sense of being collected, so the position seems to be rather appropriate for this kind of practice. In supplication prayers to the Buddhas and arhats, it is said they move as if "walking with the gait of the crane" because of their dignified or sacred outlook. The Buddhas and arhats are in a state of tremendous tranquility and have very dignified, well composed outlooks. The walking meditation mirrors this sort of dignity. We walk by first lifting the heel upward, and then the rest of the foot, on toward the tip of the toe. Then we take the step, placing the heel on the ground first and gradually the entire foot. In this way, we take moderate steps. In addition, as a gesture of turning the wheel of Dharma, the Buddhas and arhats always go in a clockwise direction, so it seems sensible and appropriate to incorporate this also. Walking this way, with the right foot first and proceeding in a clockwise direction, contributes toward a more wholesome and tranquil state of mind. Walk with moderate steps at a moderate speed. If you move too slowly, you have to concentrate too hard on your balance. You get shaky when you take too much time or lift your foot too high. If you walk fast, it is not much different from ordinary walking, so walk with a moderate speed. As we all know, when many people do a wholesome activity together, there is an enormous achievement of something positive, just as when many people make it a point to do an unwholesome activity together, the result is an enormous amount of destruction. This principle definitely applies to meditation practice, and I would like you to keep in mind the importance of group practice. Of course, we get a general sense of inspiration and support from the presence of each other, but there is also more than that. In this room, for instance, when one candle is lit, there is some light and some warmth, but if there are more candles lit, there is more light and more warmth. 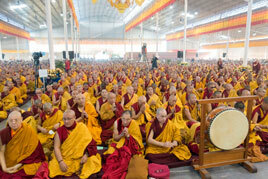 In the Buddha's time, there was also a tremendous emphasis on group gatherings and group attitude. There was a genuine understanding among everyone involved as to the importance of meditation, and the attitude was to decisively go ahead and actually do it. With this attitude, people would make the effort and come together to do practice. The truth is that if, for instance, five people meditate together, each one will share the benefit of five people. In spiritual situations as well as ordinary situations, group cooperation is encouraged because there is greater effectiveness. Some people may think this cannot be true, because well-known realized beings such as Milarepa went away by themselves into solitude. If group effort were so important, perhaps Milarepa would not have left society. However, for Milarepa it was not that leaving society was important--it was that he was the only one of his kind. Whether in a group or by himself, he was basically alone in his uniqueness, determination, insights, and so forth. If there had been many like Milarepa who came together and did what Milarepa did, the same realization could have occurred for them also, but there were not many like him, unfortunately. After Milarepa developed his great realization, he brought inspiration to others, and he transmitted the teachings with skillful means. There used to be a saying that wherever Milarepa was, the whole province (or in fact, all of Tibet) was filled with repas, or cotton-clad yogis. 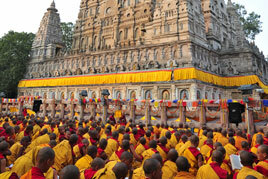 Thousands of Milarepa's disciples meditated together and went places together like an army of yogis. With their different realizations, they demonstrated signs of realization to each other, inspiring each other in that way. 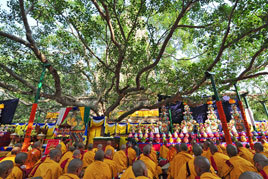 During the time of the great Gampopa, there were often as many as 50,000 people at one session of practice or teachings. If it had been important for these people to practice individually in separate places, that could have been arranged and could have been emphasized. Instead, practicing together was most encouraged, wherever it was convenient. 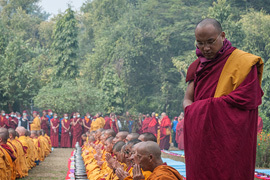 Throughout the Buddhist teachings, great emphasis is placed on the importance of working for the benefit of others. This is important for others, and it is important for us to be involved with such wholesome activities. We all have some sense of how important this is, yet at our level, there is not much we can do for others. What we can do as individuals is very limited. Sometimes there is perhaps a little something we can do with our speech or with our bodies, if we can provide something someone needs. We may genuinely have the aspiration or the desire, but in actuality there is not much benefit we can extend, or that we know how to extend. With this in mind, we should realize that the activity of meditating together and helping each other in a group is definitely the way to start benefiting others. One of the important benefits of a center for the practice of the Dharma is providing a place to extend cooperation or participation. Perhaps a person cannot do much as an individual, but a group can do a lot. The benefit we are able to extend toward others is equally beneficial to us. For instance, working together as a group and putting forth all the sincere effort and actions we can extend and contribute allows us to have visits by some of the highly realized masters. Many of them are truly a cause of liberation at sight, which means that seeing them could certainly be the cause for our ultimately experiencing liberation. 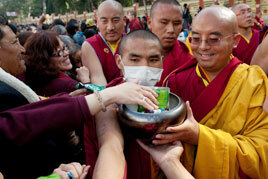 This occurs because we are able to connect with their auspicious aspiration to benefit others. Because of our cooperation as a group, hundreds of other people are able to come into contact with a great master and hear and see him. The benefit that is brought about is enormous, and it is the highest benefit, the highest possible benefit. Even if you practice by yourself, it is good that you are practicing. If you are just keeping yourself aloof, though, and not really extending yourself to others, you are not contributing much benefit. It is very doubtful any teacher or any great master will be able to fulfill your wishes of coming to visit simply for your sake alone. Probably there will be more important things for the teacher to do than just visiting one particular individual. Suppose you make the effort to go to a certain great teacher to receive instructions. With these instructions, you come back and work on them. Understanding them requires a certain wisdom and realizing them requires a great amount of diligence. However, it is questionable that you will gain much realization. Even if you do gain some, it is questionable how long it will take you. After gaining these realizations, you would finally be able to go out and help others, but a long time would have passed before you had reached that point. Even then, how much you would be able to do is still questionable. Therefore, the important thing is to do everything you can for others right away, and to keep going and expanding on that rather than waiting to be able to do something really extraordinary at some future time. That future time may never come. One of the ways in which you realize the most is when you are able to extend yourself to others. This will make situations thoroughly workable. 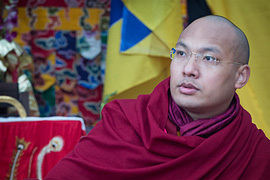 We should have a tremendous sense of gratitude and appreciation for the Venerable Chogyam Trungpa Rinpoche and the Venerable Kalu Rinpoche, who were the main pioneers in introducing Tibetan Buddhism here in the West. They have gone through immense hardship and difficulties while starting many centers and emphasizing the importance of these centers. 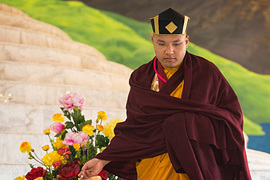 As a result of their diligent and compassionate work through the years, many great teachers--the highest great teachers in the lineage--have been brought to this country and other parts of the Western world. This also resulted from their encouraging students to be together and work together. Now the benefit has been brought into your lives, and you can bring it into the lives of others. From the beginning, the idea has not been to develop some kind of "groupism" or some kind of organization separate from the others for the sake of a particular identity. That has never been the intention or purpose. The purpose is that if we work together with cooperation and understanding, whatever benefit we could not extend to others by ourselves, we can extend with help from others. The benefit we extend to others, and the meritorious accumulation developing from this, is inexhaustible and unequaled by anything we normally think of as precious and valuable. For these reasons, please understand that your efforts and energies together are always appreciated and that continuing to work in this way is very important. For instance, at the beginning of the Buddhist path, when refuge is given for the benefit and enlightenment of all beings without exception, you relate to the enlightened objects of refuge as the highest inspirations for being able to benefit others. Having taken this vow and made this commitment, henceforth you do whatever you can for the purpose of benefiting others. This could be a cause for feeling a tremendous sense of joy at being able to fulfill the commitment you have had the good fortune to willingly make. When you work together in this way, a great deal of goodness is achieved. 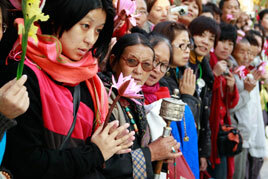 You are contributing toward the preservation of the Dharma. You are contributing to your own realization through meritorious accumulations, which are an inseparable part of true realization and which are absolutely indispensable for true realization to take place. You are contributing by benefiting others. You are fulfilling the wishes of all the Buddhas and bodhisattvas and of your own teachers. 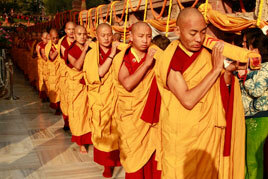 In all ways, when very profound and noble activities are performed, the path is being followed. As practitioners, we have certain roles or responsibilities to which we have to be mindful and alert. In some sense, at this time we are still pioneers. As such, we are each quite important. Were present something that could make an enormous difference in the lives of others. Everything makes a difference--the kind of work we involve ourselves with, the way we present ourselves, as well as our ability to extend cooperation, accommodation, openness, and generosity. By developing these qualities in our participation with the centers, we are not only doing the best things for ourselves, we are also setting a very high-quality example for others. We are social beings. Influence plays an important role. We may influence someone in a very wholesome way, and that person may affect someone else, and so forth. Though we may have started out extending a wholesome influence on only one person, that influence could expand to many others. From this point of view, our responsibility for a task has extraordinary importance. On the other hand, a person may have the sense that "I really need to do my personal practice, and in terms of working for a group, or making financial contributions or providing space or time, I cannot make a contribution because my own practice would suffer. Because of my personal practices, I can't do much." In one sense, this is preserving the Dharma through practice, but in another sense, it may also be the cause for its degeneration, because someone else may think, "Well, this person is supposed to be involved with the practice but is not extending good things toward others, so why should I?" That kind of influence may spread, and then maybe only a few people take genuine responsibility. It is very fortunate for them to be able to do that, but if there are only a few, it will not be very easy. Another thing is that it was never promised that involvement with the Buddhadharma and upholding our commitments would be easy. It is quite obvious we are not committing ourselves to a simple and easy task when we say we are going to aspire to work for the benefit of all beings. We are, in fact, committing ourselves to quite a difficult task, yet one that is worthwhile in all respects. No matter how insignificant our contribution may seem, we can play a part. I have confidence that all of you are doing your best to extend yourselves toward each other in whatever ways are possible. There is always appreciation and admiration and respect for that. This kind of involvement is very important, so you must not give up; you cannot afford to stop. Please, do not abandon it at some point, or get discouraged, or minimize your efforts and your activities. Keeping a sincere sense of commitment and extending yourselves toward others through the centers establishes and brings about a genuinely mature ground for effective realization of the meditation. We have talked about different kinds of obscurations, and we need to realize that one of the main reasons for these obscurations is not being able to extend ourselves toward others. When a person meditates over a period of time and has certain things coming up, it is often uncertain whether these things should be regarded as obstacles or as insights. At such times the person would normally approach a spiritual friend, or teacher, for clarification. However, since you may not be able to see a lama on a frequent basis, and since I am confident you will meditate diligently and consistently, I would like to say just a little about the things that could come up and how to relate to them. The first point to remember is that it is excellent if you are able to meditate for a long period of time, such as one long session or several sessions every day. The longer and more frequent, the better. It is a process of training. If you cannot do that because of your responsibilities and pressures, then devoting at least some time every day is very important. In other words, doing the meditation practice consistently is extremely important for making the practice really effective and bringing you directly toward the experience of the possible benefits. It may be that some days you are able to meditate for a long period of time, and on other days for only a short time. Nevertheless, doing the practice consistently is very important, so always keep this in mind. In formal meditation practice, it is important to always be on the safe side and not to have hesitation and expectation, or hopes and fears. Simply do what you have to do, and follow the techniques. Nothing drastic is going to happen immediately, anyway. If you indulge in all sorts of anticipation, expectation, and imaginings, you will simply be giving yourself a lot of feedback. Through the practice alone, nothing drastic will happen. Yet as we continue to meditate consistently, over a period of time, certain experiences are possible. Sometimes as we meditate, we might get to the point where we are having so many thoughts and distractions that we feel discouraged and think the meditation has gone bad somewhere. It may seem some terrible obstacles have arisen, something has gotten twisted around, or some change has occurred in the chemistry of our being. Sometimes this happens when a person is at the edge of some realization. When it happens, we should simply disregard this kind of experience and just keep going with the technique. At other times, the experience could be the opposite: very tranquil, absolutely peaceful and harmonious. A person could even get the idea that "If there is really some state of non-thought, maybe this is it, and now I have experienced it! I am really experiencing it! I have achieved it!" A person could get into that kind of excitement and get attached to the idea of having achieved realization. However, this is not the genuine achievement we seek. It is really quite fleeting, not a consistent or sustainable experience. The next day or even a moment afterward, it will not be there. A true realization achievement is not that unstable, so again, in the event of this happening, simply disregard it and keep going with the technique. Just be aware of the whole experience. Another possibility is experiencing an incredible sense of lightness. This is not anything that would happen right away, or in any particular order, but you may be in a state where you really have to check on whether or not you are there--checking back to your feelings and body. You have heard talk about insubstantiality and emptiness and begin to think "Maybe this is something of that! Maybe I am beginning to have some realization of the truth of insubstantiality or of emptiness!" Once again, do not fixate on this experience or "buy into it" by giving it a great deal of significance. Simply remain aware, and observe these kinds of experiences. 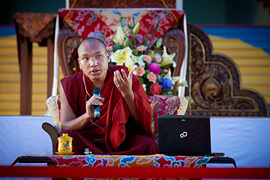 Taken from a transcript of a teaching given by Khenpo Karthar Rinpoche at KTD. This transcript is available in its entirety from Namse Bangdzo Bookstore.